Running a business along with an Agile methodology may be seen as a thing of fashion, correct. But there is also real value behind it – with smoother organization, and better distribution of tasks, achieved by running the show by self-organizing, cross-functional teams – goals tend to be achieved quicker, the process is constantly being improved upon and, thanks to the clarity of the process stages, all of the team are more aware of the big picture, hence able to make their bit of work better suited to the demand. Agile methodology is most commonly associated with Scrum and Kanban methods of managing projects. Although different in their specific approaches, they are both based on the idea of visualizing the workflow and dividing it into distinct process stages, by that facilitating better progress monitoring and tasks distribution. There is more to these two methods than this, but the element of visualization is key to the success of the approach. All business rests on people's ability to communicate. And with the necessity to communicate comes the communicator's responsibility to make information understandable and clear to the receiver. Very often, without delivering a clear message or by over-talking an idea – the idea will not be understood. This, in turn can very well result with lack of new business, misunderstandings and failure to develop new ideas and projects. We're all familiar with the “a picture is worth a thousand words” saying, and it is the gist of what visualization in Agile helps to achieve. By use of the Agile approach in your organization you're placing yourself on the road to process improvement, more effective teamwork and a quicker arrival at the desired results. Along with that you're making the process easier to understand by team members and promoting responsibility for the work they do (assignments are known to all on the team and so is the progress on the work). On top of this, you're helping the team members cooperate better and learn from each other more, since people can observe who excels in what and ask for advise. 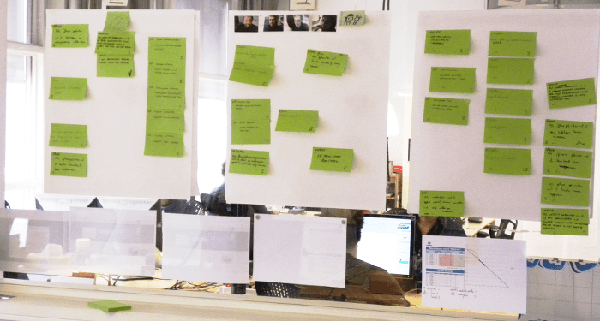 And most importantly – since in most Agile organizations the Agile boards are also visible to the stakeholders, they too get a clearer view of the process, of what you're working on and how it is coming along. So, it's not only a tool helpful in getting the client, but just as useful in keeping him informed. To utilize an Agile, visual approach right now, all you need is a whiteboard and a pen. Simply divide what you're doing into stages (the minimum is “to do” - “doing” - “done”), place work items in the columns and get to work. By representation of the work on a board, you're enabling yourself to focus on the task that you're currently working on and stay calm about the work that awaits its turn. It is actually a great property of Kanban, aimed at making sure, that the focus is on one job only – it's called WIP (work in progress) limits. Try an Agile visualization for yourself and see what it can do for your process, however big or small.